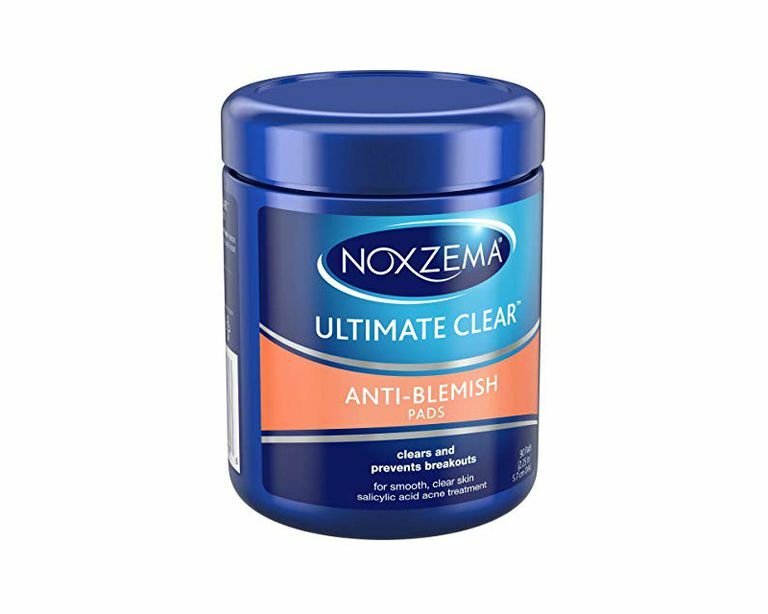 Noxzema Ultimate Clear Anti-Blemish Pads are over-the-counter treatments for mild acne. They're used to help reduce blackheads and minor pimples and keep the pores clear. To use them, simply wipe over all areas affected by breakouts. These pads won't clear up moderate to severe acne. For that, you'll get better results with prescription acne medications. You can find these pads at most drug stores, like Rite Aid, Walgreens, and CVS Pharmacy, or big box stores like Target and Walmart. You can also find them at many grocery stores as well, in the skin care aisle. Remember the old school Noxzema cleansing cream? If you were born any time before 1980, you probably used it regularly. I did (and I loved it.) These acne treatment pads will totally take you back—the scent is so uniquely Noxzema. But Noxzema has branched out and has an entire line of skin care products now. These Ultimate Clear Anti-Blemish Pads are one of the many products Noxzema has for breakout-prone skin. These medicated pads are easy to use, and basically, take the place of your toner or astringent. After cleansing, take one pad from the container and wipe over the entire face and neck. There is a lot to like about these treatment pads, the first being the simplicity. I know, it's not all that difficult to apply toner to a cotton pad. Still, these pre-moistened pads are super convenient. They're perfect when you're on the go, after hitting the gym, or when you're super tired at night and feeling a bit lazy about your skincare routine. Plus, I love the way the Ultimate Clear Anti-Blemish Pads make my skin feel. Even from the first application, I noticed a difference in the softness of my skin. The pads also make the skin feeling super clean, without any weird residue that other medicated pads sometimes leave behind. The cooling, tingling sensation lasts for several minutes, but it's a good tingle. The Ultimate Clear Anti-Blemish Pads do have one glaring drawback – they burn the eyes like crazy. It doesn't matter if you keep the pads far from the eye area when you're applying. It's the strong menthol-camphor scent that does it. Every person who tested this product for me also had the same problem. The eyeball-burning doesn't last long, but it's a definite nuisance. That wasn't the only problem I had with this product. I personally felt that the pads themselves were very rough. But on this point, all the others I had testing this product for me didn't agree with me. They thought the pads were soft and fairly gentle. Apparently, whether or not you like the pads will depend on how sensitive your skin is. Still, these shortcomings weren't enough to prevent me from using the pads regularly. I actually really liked this product and thought they were some of the better acne treatment pads I've used. Remember, though, that while these medicated pads may be helpful in treating blackheads and mild acne blemishes, they won't do anything for moderate acne to severe acne. And, as always, if you are already seeing a dermatologist for your acne, ask your dermatologist before adding this product to your skincare routine.